9. PCDA(O) Pune 10. The Director of Treasuries, All States 11. The Pay and Accounts Officer, Delhi Administration, R K Puram, and Tis Hazari, New Delhi 12. The Pay and Accounts Office, Govt of Maharastra, Mumbai 13.The Post Master, Kathua (J&K), and Camp Bell Bay 14. The Principal Pay and Accounts Office, Andman and Nicobar Administration, Port Blair. Subject: Implementation of Govt. decision on the recommendations of the Seventh Central Pay Commission in respect of the Post-01.01.2016 retired Armed Forces Pensioners/ Family Pensioners : Reg. New PPO Series. 14. The Principal Pay and Accounts Office, Andman and Nicobar Administration, Port Blair. 3. These e-PPOs will be sent to the banks through SFTP connectivity which this office has established with various banks. Other banks, with whom there is no SFTP connectivity, are advised to immediately take necessary measures to establish the same. In the interim period till the time they establish SFTP connectivity, PPOs will be sent through email id pcdapedp.cgda@nic.in . Similarly, these PPOs will be sent to DPDOs through the CGDA WAN. Other PDAs such as Director of all State Treasuries; IE Kathmandu, Nepal; Post Office, Kathua; PAO, Delhi etc are requested to kindly immediately provide an email ID of .nic or any other domain under control of government for this purpose. Regarding submission of e-Scroll, PDAs are requested to refer to para 6 of this office Circular No. C- 169 dated 11.07.2017. All PDAs are requested to strictly follow the procedure prescribed therein. 7. The PPO series circulated by this office Circular No. 571 dated 19.12.2016 in case of JCO/ORs and Circular No. 27 dated 24.11.2016 in case of ICOs stand withdrawn with immediate effect except for those PPO’s which pertain to blocks of manual PPO’s. 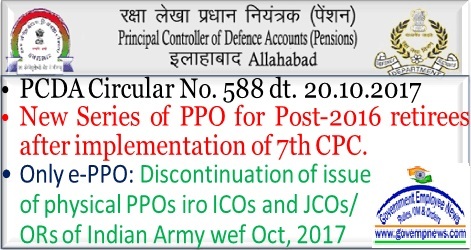 Also, PPO series for Defence Civilians which have been circulated by this office will continue to be in force till e-PPOs are started in respect of Defence Civilians by this office. 8. The change statement regarding addition or deletion of pensioners on the strength of the Pension Disbursing Authorities may be forwarded to this office in Annexure “E” to this office Circular No. 189 dated 28.02.2017 in CSV format to e-mail ID pcdap- account.cgda@nic.in . A hard copy of this change statement may also be forwarded to Shri K K Pant, SAO, O I/C Audit Section, Office of the Principal CDA (P), Allahabad-211014 in usual manner in terms of Para 17 of Annexure ‘H’ to Scheme for payment of pension of Defence Pensioners by Public Sector Banks and para 126 of Defence Pension Payment Instructions (DPPI) -2013. 9. Separate communication will be issued by office of PCDA(Navy) Mumbai and Office of CDA(AF) New Delhi regarding implementation of e-PPO in respect of Pensioners of Indian Navy and Indian Air Force respectively.